I've never been a fan of westerns. At least, not of the Americana or Clint Eastwood film variety. 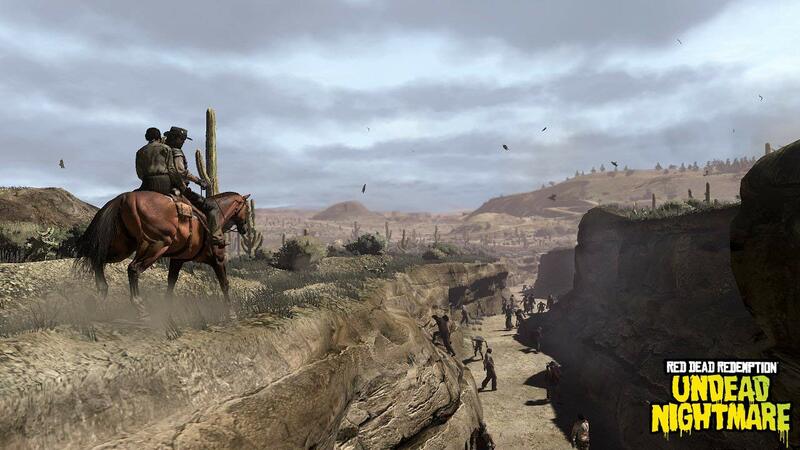 Going into Red Dead Redemption all those years ago, it was a hurdle for me to get over. Even after playing and enjoying the open-world adventure, it did not sway me as a believer in the genre. Then I played its story DLC Undead Nightmare, an expansion that saw westerns as stupid as I always did. Red Dead Redemption is by no means a game lacking of humor; sometimes, it even errs on the pesky Grand Theft Auto-level annoying side of things. 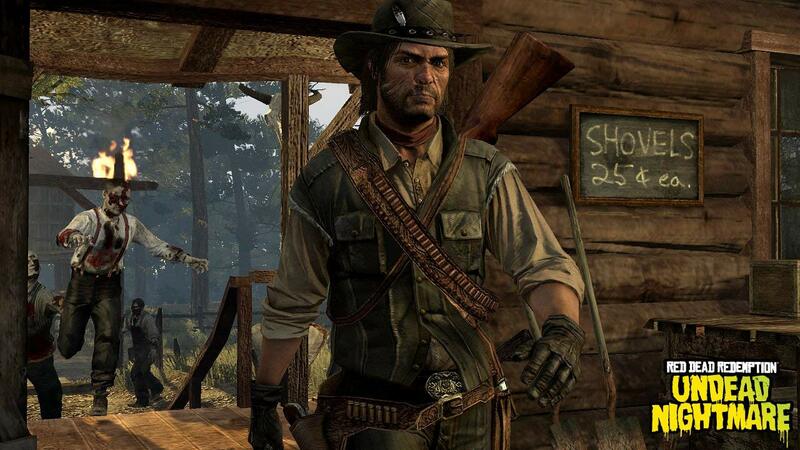 When its only single-player expansion Undead Nightmare crashed on PlayStation 3 and Xbox 360 in late October 2010, nearly half a year after the base game's debut, players fell in love with it. Because above all else, it was completely ludicrous. Definitely guilty of capitalizing on the omnipresent zombie trend of the late 2000s, Undead Nightmare reimagined the world of Red Dead Redemption as a land ripe for the apocalypse. Here, John Marston wasn't out wrestling up his old gang members for the government against his will: Instead, he's seen chilling at his ranch with his family when a horrible plague hits the frontier. It all starts with Uncle, the ranch's live-in hand who's basically family at this point despite his sort of uselessness. Uncle has caught the plague somehow, and comes stumbling into the ranch as a zombie where he bites Marston's wife Abigail, and she then bites their son Jack. Marston shoots Uncle dead in the chaos, hogties his wife and son, and plops them into a bedroom before serving them plates of food (toast for Jack, steak for Abigail). Marston is hardly shaken by this, urging his flesh-hungry family who are snarling to "stay calm." He seems more annoyed than anything. There's comedy in what may be an otherwise horrifying opening though. While all this is playing out, Marston's wearing white long johns. When he hurries over to Abigail after shooting Uncle dead, who is weeping and bleeding on the ground while holding her neck, he casually squats down and asks, "Well, you okay darling?" She's not, obviously. Marston then attributes the undead-making plague to a fever, and with some wise words to his family ("Abigail, teach the boy right from wrong"), he straps on his cowboy get-up and walks onward toward another adventure that gets more ridiculous as it goes on. What I love most about Undead Nightmare is that it embraces the goofier side of, well, everything. Of western tropes, of zombie tropes, of video games in general. As someone who isn't a fan of the western genre, it's a delight to see Undead Nightmare poke fun at Red Dead Redemption's emotional beats, at its own self-seriousness. Defying Red Dead Redemption's own tone is what made Undead Nightmare such a pleasant surprise back when it released. With the upcoming release of Red Dead Redemption 2, I doubt we'll see an equivalent. At least not of the single-player variety. Given the success of Grand Theft Auto Online in the past five years, I imagine Red Dead Online will be a similar beast to be reckoned with. When its beta launches next month, it likely will have some hiccups too as Grand Theft Auto 5's online mode did. Rockstar hasn't made any promises of standalone, single-player minded content for the upcoming western sequel Red Dead Redemption 2, as it did back with Undead Nightmare in 2010. Heck, the promise of single-player DLC for Grand Theft Auto 5 evaporated when Online became such a juggernaut. I worry that with Undead Nightmare, not only did wide swaths of its open-world NPCs die by falling victim to a zombie plague, but that single-player DLC under Rockstar died too. There's always the possibility of it rising from the dead, as zombified John Marston does at the end of Undead Nightmare. But with Red Dead Online approaching, I think if we see anything at all, it'll just be of the online expansion or event variety. There was an online component to the original Red Dead Redemption, but with Grand Theft Auto Online cementing Rockstar's online-savvy for the foreseeable future, an Undead Nightmare-like expansion or other unique add-on would probably be enough for the western. If we see the return of an Undead Nightmare-like DLC, or of any clever twist on the open-world itself, I hope that it at least has the sense of humor Red Dead Redemption's own little spin-off had. Sometimes we need a break from the dusty drama. Sometimes we just want to watch a naive cowboy in long johns think a bad fever can turn you into a zombie. For more on Red Dead Redemption 2, check out our Red Dead Redemption 2 guides hub for tips on hunting, and more. We're also partnering up with Red Dead Radio, a Red Dead Redemption-themed podcast from Kinda Funny co-host Jared Petty, which you can listen to over on the site. Tagged with Analyses,	open-world,	PlayStation 3,	PlayStation 4,	Rockstar Games,	Xbox Consoles.